Amega AmWater Actify Water Ionizer uses the Ultra Fine Biostone .01 Micron cartridge filter. 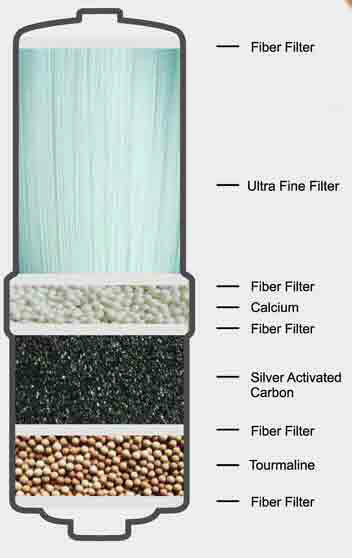 The Ultra Fine Biostone Cartridge Filter has a great reputation and is a sought after filter for water ionizer manufacturers. The Biostone Ultra Fine cartridge filter is the ultimate water filtration device. It is the finest (smallest micron) domestic filter available and will remove virtually everything except for the essential alkalizing minerals. Typically, if on city water we recommend the regular Biostone filter but for well water and where there is hyper-allergy issues we recommend the Ultra Biostone .01 Micron filter. The picture below shows a single .01M filter magnified 40 times. Hundreds of these are in a Biostone Ultra Filter. See Also: Viruses, Bacteria and Fungi, Sizes and Significance. 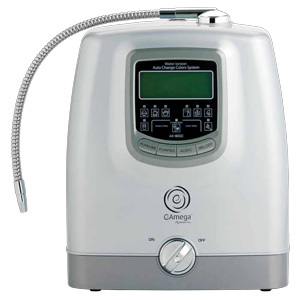 We don't sell the Amega AmWater Actify Water Ionizer, but we thought that it would be helpful to include some information about the Actify water ionizer so you can compare it to the other water ionizers that we carry. The eAmega AMWater Actify is a machine that produces both alkaline and acidic water from tap water. It addresses the imbalance of every day physical signs at the energetic level to reorganize” your bio-energetic field. In the state of omeostasis (complete balance), your innate restorative and balancing processes and optimal wellness can be restored.